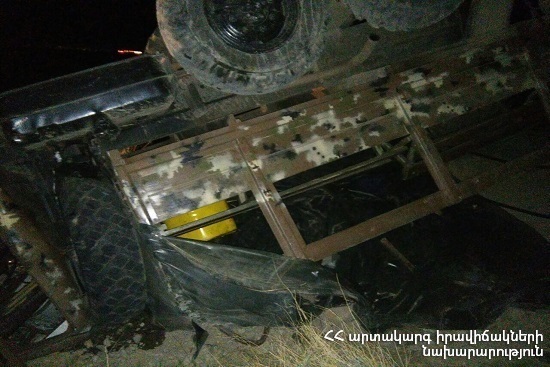 On April 11, at 20:31 an emergency call was received to “911” service that a car accident had occurred on Meghri-Tsirani Dzor roadway: a car of the military unit of the Ministry of Defense had turned over, the rescuers’ help was needed. It turned out that “ZIL-131” car of the military unit had run off roadway, crashed into the rock and turned over on the 22nd km of Meghri-Tsirani Dzor highway. Before the rescuers arrived at the scene the soldiers (Sh. G. born in 1995, A. G. born in 1998, M. J. born in 1999, G. G. born in 1999, D. S. born in 1999, A. H. born in 1999, Sh. A. born in 1999, V. S. born in 1999. A. A. born in 2000, K. M. born in 2000, G. S. born in 2000, A. S. born in 2000, G. A. born in 2000, A. E. born in 2000, R. S. born in 2000) had been hospitalized to the medical center of Meghri town. According to doctors the casualties were in fair condition. The rescuers disconnected the automotive battery of the car.